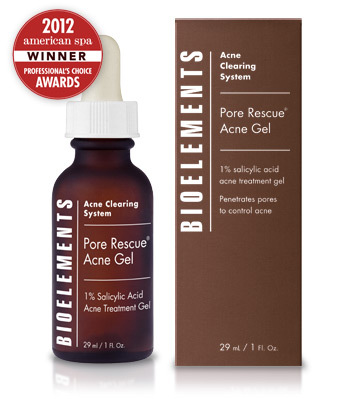 Bioelements Pore Rescue Acne Gel 1 oz available now at BeautyStoreDepot.com. A light, clear 1% salicylic acid gel treatment penetrates pores to clear skin. This AM/PM treatment works invisibly to penetrate deep into pores to control acne pimples and help keep skin clear of new whiteheads and blackheads. Your epidermis, or outermost layer of the skin, extends down into the follicles, forming a lining. Dead skin cells shed inside the follicles in large clumps. In people with acne, these dead cells stay in the follicle, where they mix with sebum and form an impaction called a micro-comedo. When the impaction builds, it flows to the surface of the skin. In some cases, it causes the pore to dilate, creating an open comedone (a blackhead) or it becomes a closed comedone (a whitehead). Pore Rescue Acne Gel works by penetrating deep into the pore with 1% salicylic acid to keep skin clear of whiteheads and blackheads. Cleanse the skin thoroughly before applying this product. Cover the affected area with a thin layer daily. If bothersome dryness or peeling occurs, reduce application to every other day.